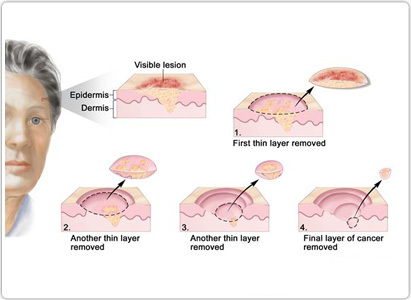 Skin cancer is a kind of malignant cancer develops in skin. It inclines to develop in the exposed skin, for example, the skin of head, face, neck and back of hand and so on, the incidence in these exposed regions takes up about 81.1%. 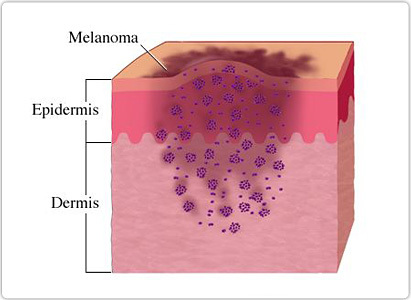 Skin cancer tends to develop in old people, especially the ones in an age ranges from 51-30, and the ratio between male and female is closed to 2:1. White people get a highest incidence of total. What Kind of People is Tending to Have Skin Cancer? 1. The people who have outdoor activities frequently. 2. More than 2 family members have been suffered from skin cancer. 3. Hair is inclined to red and golden colors. 4. The ones who are easier to develop macula on skin. 5. The people have ever experienced serious sunburn in childhood. 6. The workers have to contact bitumen, tar and mineral oil frequently. 1. Diets after surgery. A post operative skin cancer patient, whose vitality is exhausted and get blood trouble, should take the food can supply vitality and blood, such as rice fruit, hyacinth bean, Chinese date, mushroom, carrot, Common Yan Rhizome, arrow root porridge, beans and so on. 2. Diets in radiotherapy. Yin-fluid would lose in radiotherapy that the patient should take the foods to nourish yin to tonify fluid and humor, and then the first choice is vegetables and fruits, such as spinach, water lettuce, lotus root, Chinese white pear, banana, grape and so on. 3. Diets in Chemotherapy. Qi and blood are damaged in chemotherapy, so the foods can nourish qi are the best for patient, like English walnut seed, tremella, mushroom, water chestnut, pearl barley porridge, etc. 1. Patient should reduce the time of exposing to sunlight. 2. Patient has to go to hospital for diagnosis and surgery once suspected recurrent lesions are found. 3. Skin cancer trends to develop frequently, strict observation on skin should be taken during the care, especially the covert skin behind ears. There are many treatment methods for skin cancer, such as Ar-He knife, particle implantation , body cell immunotherapy , targeted therapy with integrative Chinese and Western medicine, so the appropriate therapy should be selected according to the specific diseases. Furthermore, the health condition of the patient should be considered comprehensively. 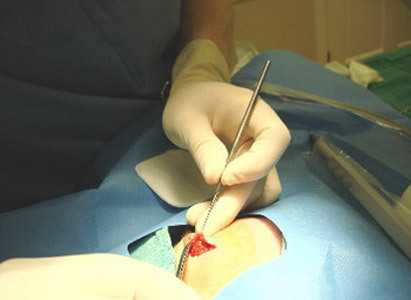 If the patient is suffering from coagulation disorders or under anticoagulation therapy (ACT), the treatment with no bleeding must be adopted, such as Ar-He knife, particle implantation, and immunotherapy. For those who cannot bear the treatment mentioned above, such as the old and sick people, female patients who cannot bear a long period of radiotherapy, targeted therapy with integrative Chinese and Western medicine. Body cell immunotherapy infuses immune cells (which are active to fight cancer) into patient’s body, so as to directly kill tumor or activate immune response to fight against tumor. Body cell immunotherapy is a green therapy to fight against skin cancer, which can completely remove residual cancer cells and dormant cells in blood and lymph, and has irreplaceable advantages in killing tumor cells, resisting tumor recurrence and metastasis. Therefore, body cell immunotherapy can well make up for the damage on body’s immunity caused by surgery, radiotherapy and chemotherapy, so as to bring hope to the skin cancer treatment.